Teenagers develop at different rates and can have widely differing heights by the age of 18, so you won't find an ideal weight for every 18-year-old. It's possible, however, to determine a range of healthy weights for those at this age based on height and gender. For those under 20, a normal weight is anything between the 5th and 95th percentile on the weight-for-age charts used by doctors. According to these charts, an 18-year-old boy is at a normal weight if he weighs between 117 and 207 pounds, and a girl should weigh between 100 and 181 pounds. These charts don't take height into account, however, so body mass index, or BMI, may be a better indicator of a healthy weight. 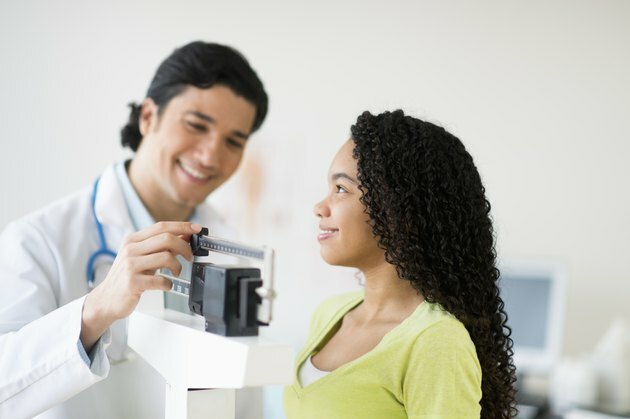 Doctors use body mass index to estimate whether you're within a healthy weight range for your height. Using an online BMI calculator is the easiest way to figure out body mass index. Although in adults, a healthy BMI is considered anything between 18.5 and 24.9, an 18-year-old may still be growing and thus their BMI is interpreted as being healthy if it falls between the 5th and 85th percentile on the BMI-for-age charts. An 18-year-old boy should have a BMI between 18.2 and 26.3, and a girl is healthy if her BMI falls between 17.6 and 26.1. You can also use an ideal body weight calculation to get an idea of what is healthy for someone of a given height. For teenage women, start with 100 pounds for the first 5 feet of height and add 5 pounds for each extra inch; for young men, start with 106 pounds and add 6 pounds for each extra inch. This formula is for those with a medium frame; if you have a large frame, you should add an extra 10 percent. If you're frame is small, subtract 10 percent. Thus, a 5-foot, 5-inch tall girl with a medium frame should have an ideal weight of 125, and a boy of the same height would have an ideal weight of 136 pounds. An easy way to tell your frame size is to encircle your wrist with your thumb and middle finger. If the finger and thumb overlap, you have a small frame. If they just meet, you're a medium frame, and if there's space between them, your frame is large. None of these calculations take body composition or body fat distribution into account. Having a waist circumference that is larger than recommended can increase the risk of heart disease and other health problems. A large waist indicates you may have too much fat around your organs, called visceral fat. The waist-to-height ratio is a good way to check for this increased risk, according to a study published in the International Journal of Obesity in 2008. An 18-year-old's waist circumference should be no more than half her height. This means a 5-foot, 5-inch tall teenager should have a waist circumference of no more than 32.5 inches. Is There an Ideal Body Size Calculator for Women?